I was asked just after Christmas to make a set of steampunk wedding favours. After some useless excitement, a lot of daft ideas and finally some sensible thinking, I decided to create a design using royal icing transfers, where the elements are piped onto a translucent silicon sheet, or parchment paper, tracing a print of the design underneath. Given a couple of days to dry thoroughly, these delicate icing embellishments can be carefully peeled off, and attached to the main cookie (once you've discarded the many, many, many broken ones and tried not to get too disheartened). Of course I had to start with cogwheels. Once piped in a couple of colours, I painted over with shades of brown to mimic the streaks of polished brass, then sprayed them with a mixture of gold and bronze lustre spray. 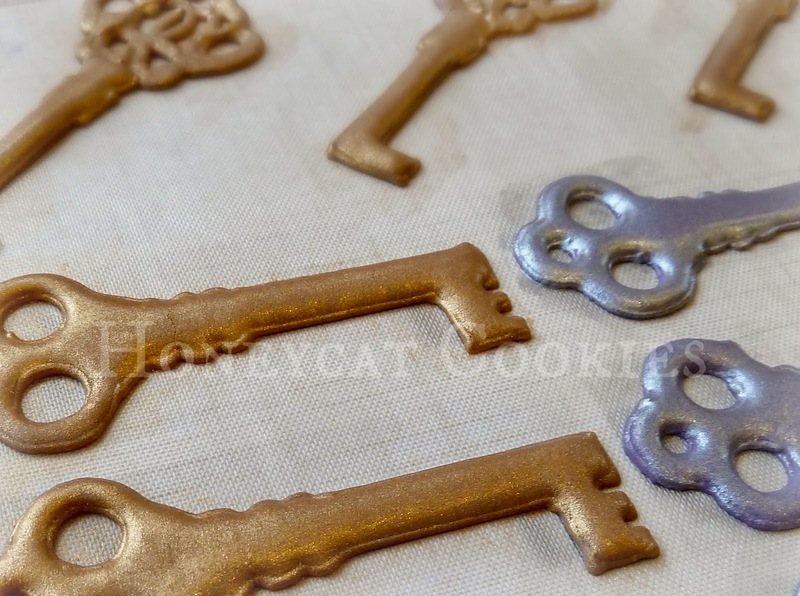 The client requested keys which also fit nicely into the theme of metallic working parts and were an opportunity to add a little more elaborate detail, though of course the stems were extremely delicate and prone to breaking. I painted these in lustre dust mixed with a little alcohol-based lemon essence for a brighter metallic gleam. I wanted to include the wedding date, and thought of a variety of ways this could be done, but decided 'typewriter keys' would add a little more dimension. Piped in purple, and sprayed with gold, then outlined in brown which was then painted in gold. Much less prone to breakage and very satisfying to make, so I now have lots spare. What I really wanted to do was to create something delicate and pretty whilst being obviously steampunk, so I decided to use the base as a form of decorative 'backplate' to the working parts above, using the filigree wet on wet technique onto which I gently dropped the seperate elements. And this is where I started to have fun, as late at night, half way through, I very sensibly decided to record the process, never having made a video before. This first video shows this stage of the cookie decorating, highly edited to remove the parts where you can't actually see what my hands are doing, and set to a marvellous piece of music called Requiem for a Fish by the Freak Fandango Orchestra - how could I not choose a piece of music with that name?! - because I have no intention of letting anyone know what my voice sounds like. This second video shows piping of chain links, the date, and 'rivets' to finish off the base, set to Roberto Billi's Sfioro because it's a great piece of music (though I don't know what he's singing about!) and because he's wearing a top hat on the album cover. I have a particular love for anything Steampunk. I remember playing the game "myst" about 17 years ago and I love the Myst music. These are perfect steampunk cookies! Do you have a video of piping the filigree pattern? If not, do you think you will make one? I've seen the wet on wet technique for filigree before but never this thin and delicate. It's absolutely gorgeous! 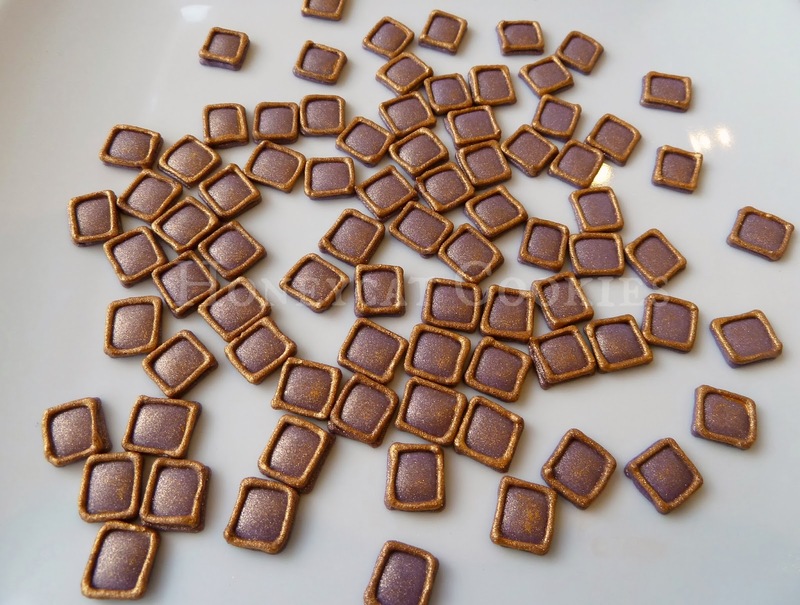 Everything about these cookies is amazingly beautiful! Thank you Donna! These are the only videos I've made so far, and the filigree one was the first I've ever done, hence the learning curve re camera position! 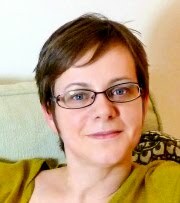 I am aiming to make more, including a clearer one of the filigree. 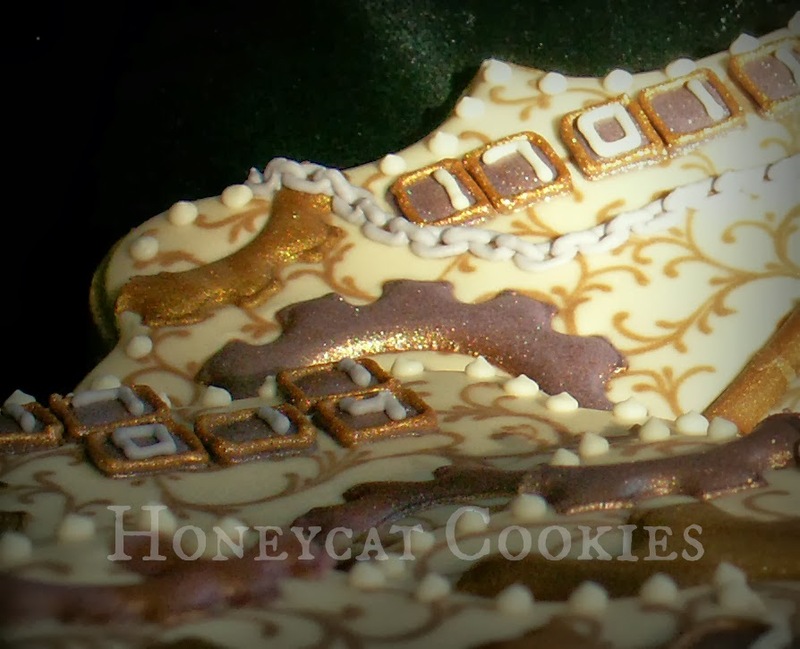 Keep an eye on my Youtube channel, Honeycat Cookies. It was an absolute pleasure Elizabeth! I had great fun with the videos! Oh my goodness! 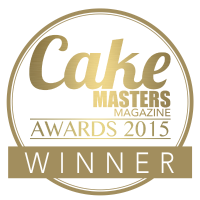 You occupy a distinguished position in my pantheon of great and revered cookie artists!!!!! 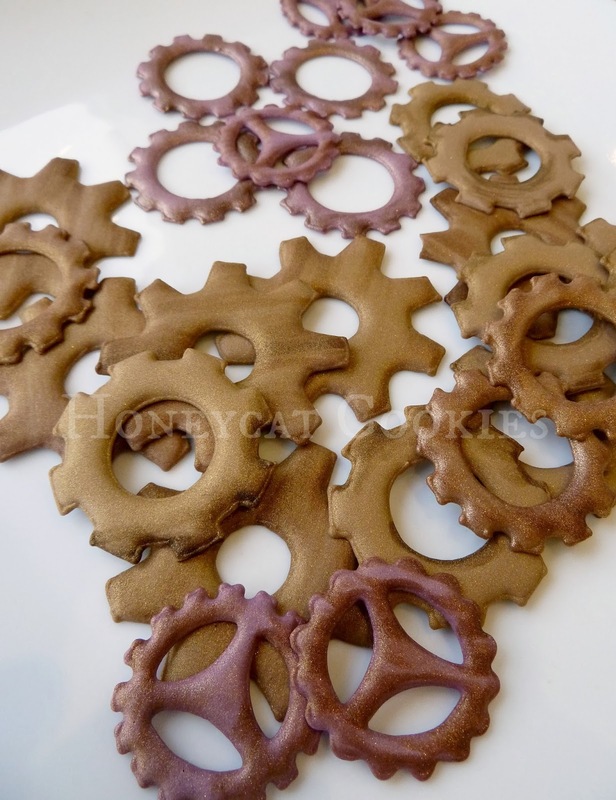 These Steam punk Cookies and the Fox Cookies you made for Valentine's Day for your Hubby were stupendous! 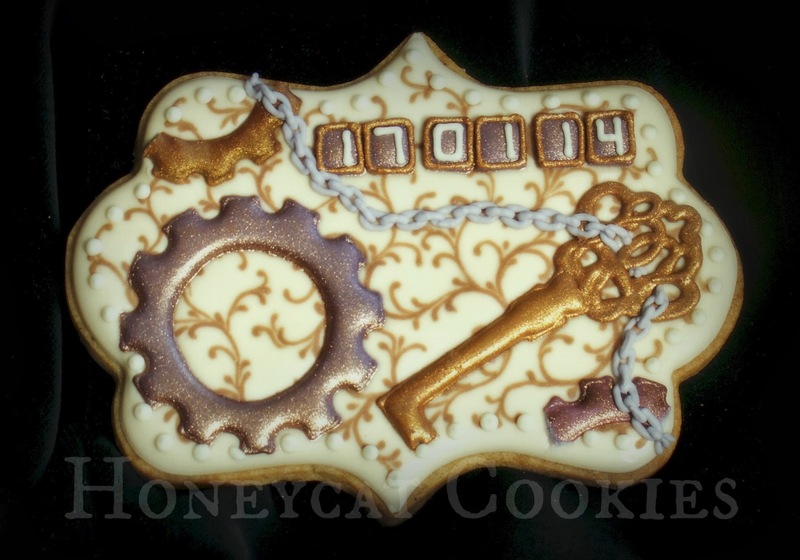 For the steam punk cookie, I could hardly believe that the cogs, keys and little squares were piped and weren't from molds! And, your filigree piping, what can I say? !